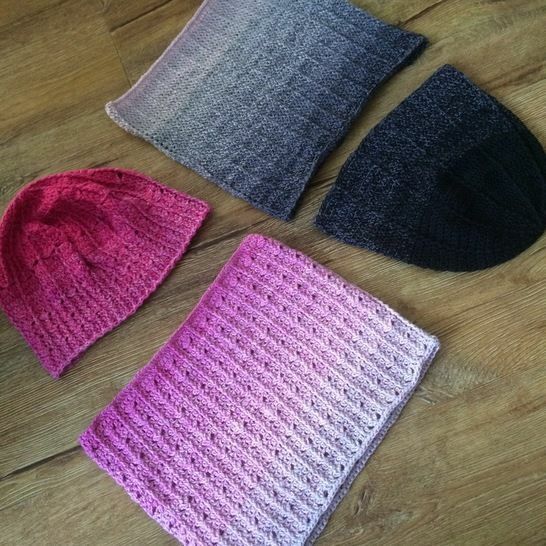 Use one Scheepjes Whirl to make two lovely hat and cowl sets. One set has simple raised (post) stitches and the other has raised (post) stitches and lace. The shade in the sample is Night Time Bubbles. The Plain Hat is a simple beanie shape. The Fancy Hat has a slightly slouchy shape, with decreases before the brim for a neat fit. Suitable for adventurous beginners up, worked in rounds with no seaming. The same size hat fits my 9 year old, my teen and me, with the fit being slouchier on the younger child. Gauge after working the first 6 rounds of each hat is 4cm/1.5” measured from centre to edge. The gauge is less important for the cowl - check that it slips over the head after working the initial ch. Either set would be beautiful made from a skein of hand dyed sock weight yarn - just make the hat first and use the remainder of the yarn for the cowl.